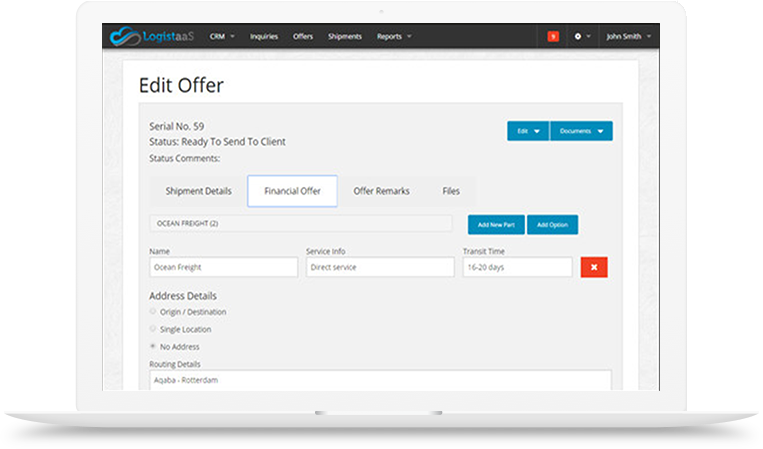 LogistaaS is the best cloud software solution for medium and small-sized freight forwarders looking to improve their competitiveness through technology and streamline their day-to-day processes. We are user friendly, developed using the most advanced technologies, and integrated with many shipping lines and airlines. Schedule a demo to get a free trial. Every year, hundreds of thousands of shipments are processed through LogistaaS by freight forwarders in 30 countries around the world. We have offices in Dubai and Amman, coupled with a growing network of local partners in many countries around the world. LogistaaS gave us great visibility into the operations and performance of my team. It significantly reduced the time spent doing things of lesser value, and allowed us to focus on what is important. With LogistaaS we were able to reduce documentation cost, use our data in a better way, and increase productivity with reporting tools. As a system, it is really cutting edge in terms of the user interface and in ease of use. the support too provided to us is also quick and efficient. Coming from a manual system, LogistaaS helped us improve our efficiency and costs fivefold. It is user friendly and their customer service is excellent. We are able to focus better on our customers now. At LogistaaS, we ensure that your organization is provided with the most secure and respectful online experience possible. What information do we collect from the people using our services? To use LogistaaS effectively, Authorized Users would have to enter Customer Data, which is data that is confidential and sensitive to their organizations, including but not limited to information about their clients, agents, subcontractors, employees, offers, and shipments. We do not, under any circumstances, sell Customer Data, nor do we share it with any other party unless it was required by law. This does not include website hosting partners and other parties who assist us in operating our website, conducting our business, or servicing you, so long as those parties agree to keep this information confidential. We may use your personal information to send you system alert messages, inform you of new features and services provided by LogistaaS, provide customer support, bill you and collect money owed to LogistaaS, or to protect the rights and safety of LogistaaS, its customers, or suppliers. We may also disclose purchase details to authorized resellers, and Customer Data to representatives and advisors like attorneys, accountants, to help us comply with legal, accounting, or security requirements. We completely understand that Customer Data is very confidential and sensitive to the customers of LogistaaS, and for this reason we have made every effort to ensure that you are comfortable in giving LogistaaS the data needed to use the Service. Customer Data is stored on secure servers, and all transactions with LogistaaS are conducted using Secure Socket Layers (SSL). LogistaaS requires a username and password to log in. You must keep your username and password secure, and never disclose it to a third party. You should also sign out of your LogistaaS account and terminate your browser window whenever you are done with using LogistaaS so that others cannot access your Customer Data. Because the Customer Data is so sensitive, account passwords are encrypted, which means that we cannot see your passwords. We also cannot resend forgotten passwords. We will only reset them. The security of Customer Data is very important to us, but please remember that no method of transmission over the Internet, or method of electronic storage, is 100% secure. While we strive to use all commercially acceptable means to protect Customer Data, we cannot guarantee its absolute security. If a security breach causes an unauthorized intrusion into our system that materially affects you or your Customer Data, then LogistaaS will notify you as soon as possible and later report the action we took in response. We will be very happy to receive your inquiries, comments, or questions! Please provide us with the details below to schedule a demo!